And if there’s a way I can do it in a make-ahead meal (that’s also easy to freeze) it’s even better! 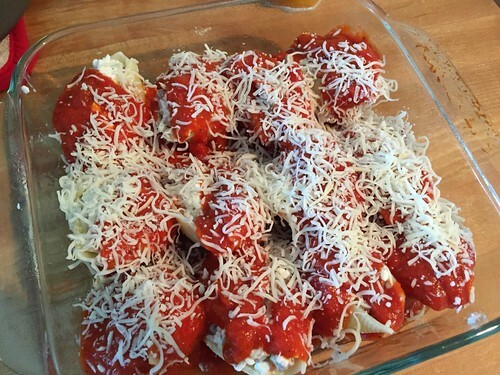 Today’s recipe for pizza stuffed shells is very basic, very tasty, and super easy to make ahead and/or freeze. 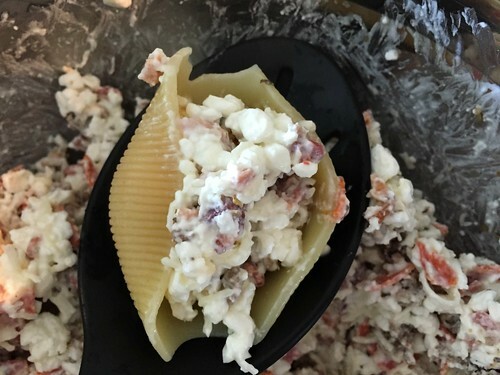 The only somewhat time-consuming part of the recipe is stuffing the shells, but it really doesn’t take too long and the kids think it looks cool! This is such a great weeknight meal when you just want to shove something in the oven and eat 20-30 minutes later! 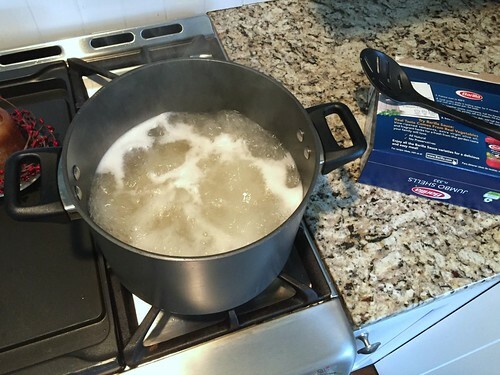 In a large pot, boil noodles according to package directions. While noodles boil, preheat oven to 350ºF and grease a 9″ x 13″ baking pan. Set aside. 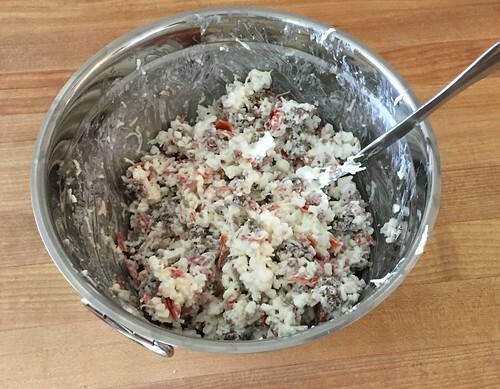 In a medium bowl, mix cottage cheese, sausage, pepperoni, bacon bits, and spices. Pour a small amount of sauce into the bottom of the baking pan (just enough to cover it). 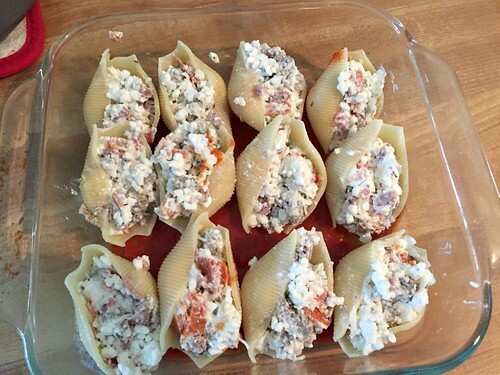 Place shells in pan, cover with remaining sauce, and sprinkle with Italian cheese. Freeze, or bake in preheated oven for 20-25 minutes (or until cheese is melted). As you can see by the pictures, I only made a HALF batch for our family and put the rest in the freezer for later. Our kids gobbled this up and kept asking for more! It’s definitely a really quick, easy, family-friendly weeknight meal! Oh, and of course, feel free to mix and match toppings with your family’s taste preferences. 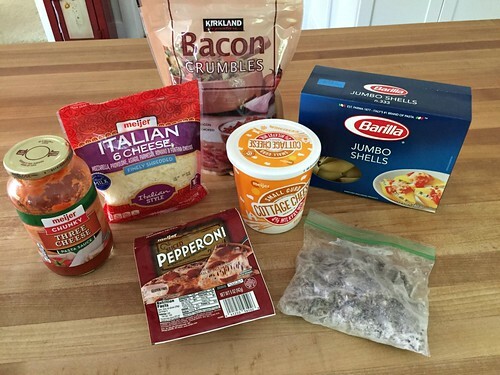 What pizza toppings would you use? I made these tonight and they were a hit. My daughter who has never liked spaghetti sauce actually ate some shell with a little sauce on it! I loved the flavor! glad to hear they were a hit! They really are quite yummy!! Do you think ricotta would work rather than cottage cheese? Texture thing, ya know. =D Can’t wait to see the baby pics! yes, definitely. I’m sure subbing ricotta would work just fine! Looks yummy. Thanks for another family friendly recipe . Praying for your impending delivery . Freeze with the sauce and cheese. At least that’s what I’ve done. 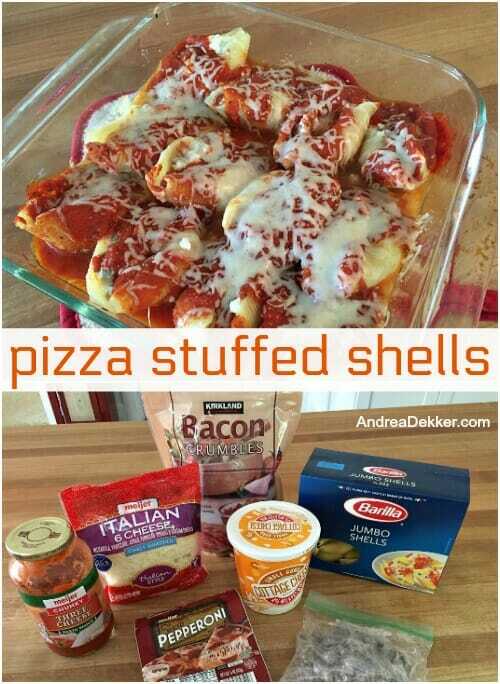 Then you don’t have to worry about if you have spaghetti sauce and cheese on hand to top it when you pull it out of the freezer. I’m hoping that the lack of belly shot here today means maybe some baby activity? Or maybe you’re just actually resting. Either way, have a wonderful weekend Dekkers! Hope it’s blessed. Haha! I totally get that. I remember I scheduled a maternity photo shoot for like a week before my second was born (he came two days “late”) and when that week rolled around I realized I had absolutely no desire to capture my current condition. Not to mention I didn’t have anything close to resembling a cute outfit at that point. I was getting by in only the comfiest of oversized lounge clothes. Thankfully the photographer let me push out the shoot until after he was born. A newborn and family photo shoot that was one of my favorites ever. Late maternity photoshoot? What was I thinking? oh my word — I would NEVER want a maternity shoot right before having the baby! I only had 1 maternity shoot, when I was 6 months pregnant with Nora and still so cute and small. That said, I’ve had newborn pictures with all my kids and even though I don’t look fantastic, I LOVE the pictures every time! This looks yummy! Pizza and pasta never disappoint around here. 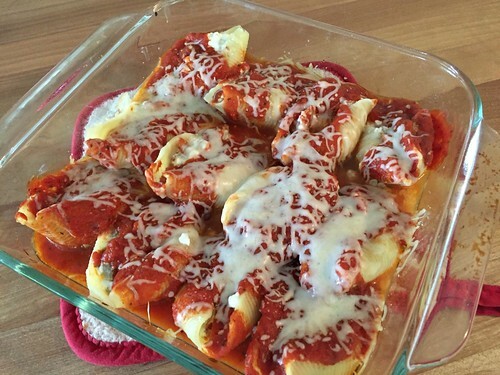 When you freeze it, do you top with the sauce and extra cheese or add those right before baking? Looking forward to seeing pictures of your newest addition. Hopefully, it will be soon! Praying for an easy delivery. you can do either (I’ve personally done it both ways and it tasted great each time).